An etymological explanation of our extreme Food-Fetish… I would simply say, ‘Blame it on our Bengali genes’! This is an emotional post for me, tugging at all the nostalgic nerves that I have in my body. It has taken me long to gather my thoughts, photographs etc – to explain as simply as I can, the nuances of traditional Bengali Cuisine. It is a cuisine that is vast and elaborate, but every time someone asks me, ‘What comprises Bengali Cuisine?’, I falter for a while as there is no simple answer to that. There are so many layers to the cuisine, so many regional variations and if we probe into the evolution of the cuisine, it will also reflect the history of Bengal. Most people I have come across are pretty much aware of Indian food. This awareness however stops at Biriyani, the Chicken Tandoori or a Butter Chicken. Or perhaps, the Dosas and the Idlies, which are completely different to North Indian food originating in the Southern states of India. Bengali food belongs to neither of the above categories and definitely not in between. An Indian map will certify that. Bengal is situated to the East of India and borders Bangladesh. And that’s where all the food stories begin. Talking about myself (you can read more about me here), I am a true-blue Bengali or a BONG to the core, the latter being the colloquial equivalent to describe a modern Bengali – the urbane and the cool version. Born and brought up for the most part in Kolkata, FOOD has shaped my personality and character. My Bengali genes are to be blamed not only for my relentless creative pursuits but also my unsatiated taste-buds. FOOD is also our most important travel companion. If there is one thing we as a family, always agree upon unanimously, then that is this – ‘WE ARE HUNGRY!’ And yes, we are proud to have been able to transfer our genes to our little ones – the Z-Sisters! But how and why did this food fetish start? For a Bengali, this food fetish begins quite early – almost at infancy as you can see from the picture above. The first ceremony or celebration that a Bengali child witnesses is Annaprashan or the ‘First Rice’. This Bengali tradition initiates an infant of barely 6 months to his/her first intake of food other than milk (the child is six to eight months old when the ceremony takes place, odd months for girls and even months for boys). Dressed up in the finest traditional attire (the girl child or the boy child resembling a mini bride or a groom respectively), it is a cute little sight to watch. Provided the little ones do not break into howling (see above how Lil Z reacts while our little nephew seems to be enjoying the adulation) which usually is the case considering the kind of spotlight the child is under! Usually, the Mama/Maternal Uncle or the Dadu/Grandfather according to some family tradition, does the honour of feeding the child a spoon of Payesh, the traditional Bengali Rice Pudding. The only other way to explain the importance of a traditional Payesh/Rice Pudding to a Westerner is to probably compare it with Champagne. If one can understand the importance of the Champagne to bring on a family celebration, then one can probably understand the importance of Payesh. Or say, cutting a cake on a birthday. For a Bengali, a spoonful of Payesh is a must on any special occasion. Also, the first spoon of non-solid food that goes into a Bengali child during Annaprashan or the First Rice is the same auspicious Payesh. In effect, Payesh is the celebrity dish that cuts the ribbon in an opening ceremony! • Of course, a variety of fish preparation accompanied by yes-you gotta-believe-me, a FISH-HEAD and a FISH-TAIL! As you probably can understand by now, the groundwork for a Bengali’s taste buds’ perpetual yearning for FOOD is built at almost his/her infancy! Bengalis world-wide are at this moment caught up in a festive frenzy. Every autumn a festive mood hits Kolkata as if Goddess Durga, comes to life. Thousands of Pujo Mandaps are built all over the city and there are thousands of ‘themes’ on which these Mandaps are built. The lightings, the structures, the extravaganza… the atmosphere is electrifying, almost carnival-like. The Durga Pujo or Durgotsav, as it is called continues for 5 days. Goddess Durga with her two sons (Ganesha & Karthika) and two daughters (Lasksmi & Saraswati), is believed to come down to earth from her heavenly abode in Mount Kailash. On the last day of the worship, the married women wear their traditional white saris with red borders and perform the Sindoor Khela where the married women smear each other with sindoor or vermillion. Well, I miss all these in Dubai although I try to replicate a few things at a special Bijoya gathering at home (yes, that’s me in the above picture and my mum-in-law during sindoor khela in 2005). During our Kolkata visit on our summer holidays this time, we visited Kumortuli – the place where the idols are made. The artisans at this time were busy making the idols, only a few of them had been given a poach of paint. But it was still a long way to go for Pujo at that time (above). What comprises a traditional Bengali meal? What follows below is an elaborate and a very traditional Bengali meal – a thing that can be conjured up only in my dreams – only because in reality how many of us are being able to cook up such elaborate and traditional meals on a daily basis? Rice – plain white rice is the main accompaniment to all dishes, unless it’s made into a Mishti Polao. Firstly, Rice is eaten with starters (mainly vegetables) with Ghee or Daal. Rice is eaten in the Main Course too, either with fish, meat or chicken. Traditionally, Bengali dishes, specially the fish, are cooked in Mustard Oil. Rice is also the main ingredient in the preparation of some Mishti or desserts – for example, the Payesh – the rice pudding, or the Pati Shapta – rice crepe with a filling of kheer. Squeezing a bit of Gondhoraj Lebu or the Bengali Lime (shown below) in Dal/Lentils, specially Mushurir Dal/Masoor Dal or Bhaja Moonger Dal/Fried Moong Dal is very unique to lunches at Bengali homes. These limes have their own aroma and something that I haven’t been able to find beyond the shores of Bengal. although we have found substitutes for many things that we miss from Bengal as we continue to lead our Bengali lives in non-Bengali shores. The closest I’ve come to the aroma of Gondhoraj Lebu is the leaves of Thai Kaffir Lime! Kancha Lanka/Green Chillis, Gondhoraj Lebu/Bengali Lime and a pinch of Salt in the corner of plate is a trademark of traditional Bengali food serving! • Dal or lentil soup: Sometimes Dal contains various seasonal vegetables or fruits in it. Very famous is Aamer Dal/Mango Lentil Soup or Amrar Dal/Dal with Gooseberry. It may also be cooked with fish pieces or fish head and fish bones in it! Cholar Dal diye Luchi/Bengali Puri with Bengal Gram Dal (left) and Aloo-Potol-Kumror Chokka/Potato-Parwal-Pumpkin Mixed Vegetable (right) is another popular food pairing. While making Luchis, a dough is prepared by mixing Maida/Flour with water, a spoonful of Ghee/White Oil and a pinch of Sugar and Salt. Small balls are made out of these dough and flattened flattened and individually deep-fried in Oil or Ghee. When Maida/Flour is substituted with Atta/Wheat Flour, it is called a Poori. And a stuffed Luchi is called Kochuri. Karaishutir Kochuri/Kochuri stuffed with mashed green peas is an absolute delicacy. Another Bengali delicacy that I miss very much and is not available in Dubai is Posto or Poppy Seeds as it is banned in the UAE because of its addictive quality (read here). However, Poppy Seeds also known as Khaskhas in other parts of India is widely used in cooking. 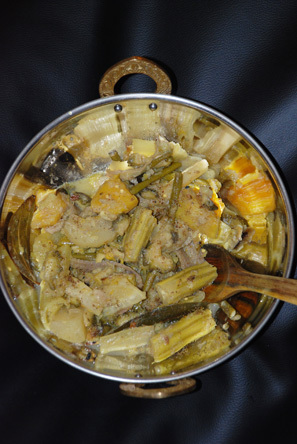 In some regions of Bengal, Posto forms a part of daily meal. Aloo-Jhinga Posto/Potato & Ridge Gourd with Poppy Seeds (below left) or simply Aloo-Posto/Potato with Poppy Seeds is one very popular Bengali preparation. Another very simple yet very delicious Posto preparation is to stir in the Poppy Seed Paste in a bit of Mustard Oil with a slit green chilli thrown in. This is known as Bati Posto (the first picture below). Fish is still cooked daily for main course in most traditional Bengali households (do read my write up A-Z of Bengali Fish). Bengali cuisine is famous for it’s Maacher Jhol or Maacher Jhaal. Maacher Jhol is where the gravy of the dish is made with ginger, turmeric, cumin powder, green chillis (the ingredients may vary from one region of Bengal to another) and Jhaal is where the gravy is hot and spicy and made with mustard paste, turmeric, chilli. Shorshe Maach/Mustard Fish is a very popular fish dish. Shown below are various Bengali fish delicacies (starting from top left) – Chitol Maacher Muitha/Chitol Fish Dumpling Curry, Pabda Maacher Jhaal/Pabda Fish Spicy Curry, Tel Koi/Koi Fish in Oil, Rui Maacher Kalia/Rohu Fish Kalia. There are obviously many many more types of fish preparation – Doi Maach/Fish cooked in yoghurt, Bhapa Maach/Steamed Fish, Maacher Paturi/Fish marinated in different spices and wrapped in Banana leaves and then steamed. Special mention has to be made to the Hilsa fish. The Hilsa is synonymous with Bengal and is considered the ‘queen’ of all Bengali fish. Hilsa is also of political importance. It is a serious bone of contention between India and it’s neighbouring country Bangladesh. Which Hilsa is better – the Hilsa that is found in the Padma river in Bangladesh or the Ganga river, the last phase of which flows through Bengal before it merges into the sea-waters of Bay of Bengal? The entire month of July and August, that is during the Monsoons, Kolkata is gripped by Hilsa. Hilsa festivals and special Hilsa lunches are organised in different clubs and hotels. Each conversation revolves around Hilsa. This year had been hard-hitting for the Hilsas with the prices shooting upto as high as Rs 1,500/kg (Dhs 100/- approximately!). The fish markets in Kolkata are in itself a subject for immense discussion – perhaps better kept for another future post (the image below shows a fishmonger showing his Hilsa catch with a lot of pride). The bony Hilsa is a delicacy and is prepared traditionally in many ways – the Shorshe Baata/Mustard Hilsa, Kalo Jeerar Jhol/Black Cumin Curry, Bhapa/Steamed etc. The discussion of Bengali fish can go on for ever. To cut it short we bring in the topic of Prawns. Bagda Chingri/Tiger Prawns and Golda Chingri/Indian Scampi go into making exquisite Bengali delicacies – Shorshe Chingri/Mustard Prawn (below right), Prawn Polao (below left), Narkel Chingri/Coconut Prawn and the famous Chingri Maacher Malaicurry/Prawn Curry where Coconut milk is used to make the gravy and is made on very special occasions. Meat or chicken substitutes fish occasionally. Generally, Rice accompanies the fish, meat or the chicken. On special occasions, Rice can be substitued by Polao/Bengali Fried Rice. ‘Luchi’ and Radhaballavi/Paratha stuffed with green Peas may also be served. Luchi is famously paired with Kasha Mangsho/Mutton cooked on slow fire. Sunday afternoons at some Bengali houses are still reserved for Kochi Pathar Jhol/tender Goat Meat Stew Bengali Style (all pictures below excepting the extreme below right which shows Chicken Curry) cooked likely in a Pressure Cooker. Equally important is the Mangsher Jhol/Mutton Gravy and Mangsher Aloo/Potatoes cooked in the Mutton Curry! And finally when Fish or Meat or chicken is unavailable, the Bengalis would also cook up a delicacy out of Eggs – the Deemer Dalna/Egg Curry! I have already stated earlier that plain white Rice is the main accompaniment to all dishes. However, different types of Rice dish are made for different occasions. Polao, the Bengali version of Pilaf is traditionally cooked in occasions and compliments splendidly with Kasha Mangsho or Mutton/Lamb cooked on slow fire, in the Bengali way. Another Rice dish is Khichuri – a combination of Rice and Lentils cooked together and is an absolute must on a typical rainy day. Unlike Khichuri cooked in other parts of India, the Bengali Khichuri is not a comfort food during illness but is an absolute delicacy when accompanied by various types of vegetable fritters (below). Though Biryani is not a traditional Bengali dish (but an integral part of Kolkata cuisine), but if ever a Bengali craves for Biryani…. and a majority of Bengalis do crave for Biriyani quite often, then it is mostly Mutton/Lamb Biriyani and must be essentially cooked in the Awadhi or the Lucknowi style! After the Chutney comes the formal dessert tasting! After Fish, Bengali Sweets is a quintessential Bengali topic of discussion. The choice in Mishti/Sweets is absolutely endless. This is a category that has catapulted Bengal into a different quotient of sweetness. Mishti Doi/ Sweet yogurt, Bhapa Doi/Steamed Yogurt, Payesh/ Sweet dessert made with rice-milk-sugar, Rôshogolla/Rasgulla, Rasamalai, Pantua, Lyancha, Chamcham, Chitrakoot, Chanar Jilipi, Kalakaand, Mihidana & Shitabhog, Rajbhog, Rasakadambo, Shondesh… the list is endless! Perhaps the most famous of Bengali Sweet is the Rôshogolla or the Rasgulla (below) – inspiring me to write an entire post on it. Shondesh is another unique Bengali sweet that is not very easily available in Bengali Sweet shops outside Bengal. Prepared with Chena/Paneer or Indian Cottage Cheese along with a variety of garnishing is very quite easy to make at home. Below are the famous Shokho Shondesh resembling the shape of a Conch or a Shonkho. You’ll find a sweet meat shop in every alley and every lane in Kolkata – whether they are small locally known shops or big branded ones – a topic that will probably come revisit my blog again. Sweets like Mishti Doi/Sweet Yoghurt and ones dipped in Sugar syrup – for example Rasgulla, comes in a clay pot as shown below. The sweets that follows (clockwise starting from the Mishti Doi) – Nikhuti, Komlabhog or a type of Rasgulla made with Orange rinds giving out strong aroma of oranges; Kalo Jaam and the Bengali Rabri. This famous version of the Rabri hailing from Kolkata is a bit different from the other Indian varieties. As the sweetened milk starts boiling, a layer of cream begins to form on the surface of the milk. That is taken off and kept aside. Repeated process of the same results in the Calcutta Rabri. Needless to say this is extremely rich and creamy and is bound to be heavy on the stomach and extremely fattening. Shown below (clockwise from top left) are Mishti Doi/Sweet Yoghurt in a clay pot; Gujias, a traditional festive sweet and the Jibe Goja (Jibe means tongue and these sweets are elongated tongue-shaped ones, hence the strange name! ); Pantua which is not the same as the famous Indian sweet Gulab Jamuns and Jolbhora Shondesh which literally means ‘filled with water’! Opening sweet boxes opened the floodgates of my childhood nostalgia. I started telling the Z-SISTERS everything about Bengali sweets and tried explaining to them how each sweet shop in Kolkata or a region and town in Bengal has it’s own signature sweet, a comprehensive list of which has been brilliantly done here. Apart from the never-ending lists of sweets easily available in sweet shops, some Bengali Sweets are traditionally made at home. Or rather used to be made at home. Needless to say that there are many varieties of these as well and require elaborate skills . Shown below are some of the sweets that are still made at our home in Kolkata… the Pithe Puli – Pithas are primarily made from a batter of Rice flour shaped artistically with a Pur or sweet fillings. Then these Pithas are dipped in milk or other types of sweet preparation. These are specially made during the harvest season and has an incredible number of variations (read here). Taaler Bora/Sweet Palm Fritters (below) is another festive home-made traditional Bengali sweet made during Janmashthami, the day when Lord Krishna’s birthday is celebrated. While Pickles don’t exactly come under Bengali Sweets, it is also a dying home-art and is being gradually being outsourced to small Pickle factories and is being relegated to a small-scale industry. I am fortunate to have a traditional Mother-in-law who is holding on to the art of pickle-making so painstakingly. I have started tracing out her journey with my first post on Pickles. In most Bengali households the Rice is cooked in a Dekchi (shown earlier along with Rice Polao). What is a Dekchi? Sutapa, the grand-dame of Bengali food blogging (14 years into food blogging! ), describes it as ‘the handleless modification of the sauce pan – the rimmed, deep, flat-bottomed Dekchi which is a hallmark of the Bengali kitchen!’ Most of the cooking is done in a Kadai or an iron Wok (shown below). The Mutton is likely to be cooked in a Pressure Cooker. The ladle that is used to cook up all the delicacies is called a Khunti and the tongs or the Sharashi helps to transfer the hot pots and pans firmly from the fire to the kitchen counter. Haata is the aluminum serving spoon that is used to serve food and you’ll be having Bhaater haata to serve you Bhaat/Rice; Daaler Haata to serve Dal/Lentils and so on. Spices are ground with a Shil Nora – a grinding stone used in most Bengali kitchens to make Masalas Pastes where one rolls the mortar back and forth on a stone slab sitting on the ground. Vegetables are cut using a Boti where a long curved blade on a platform is held down by foot and both hands are used to cut the vegetables by moving it against the blade. The cooking oil used is mostly Mustard Oil though most modern households have shifted to other cooking mediums that are being advertised as heart-healthy! The unique Bengali spice is Panch Phoron/the 5 spice Mix (picture shown earlier along with Chutney). Many of us who have now made our homes on the shores beyond Bengal, have substituted various things to complement our Bengali Cooking. We have adapted ourselves and learnt to make good of what is available in the local markets. Most of the Bengali friends of my generation grew up studying for exams and not entering the kitchen that much. We ate what we were served by our Mums. It’s only when we began living our own lives that we started resorting to Bengali Food as our fall back comfort food. Binging on traditional Bengali meals when visiting our parents’ homes on holidays and waiting for someone more experienced in Bengali cooking – were the only ways to experience the meals that we grew up on. Where do I get Bengali Fish from? Most Bangladeshi markets stock frozen packets of the different fish that are used in Bengali cooking. So you’ll get Koi Fish frozen fresh, packed in Thailand and flown many miles to Bangladeshi markets world wide. While we didn’t find any Bangladeshi market in Colombo, Srilanka, our stay in Frankfurt wasn’t devoid of Bengali Fish! Our stints in Colombo, Frankfurt and Dubai have taught us that if one is looking for Bengali food products that are available outside India, they can only be found in Bangladeshi shops and Asian supermarkets selling Bangladeshi products. In Dubai, a few Bengali fish is available in the supermarket Citi Mart near Imperial Suites Hotel, located on Rolla Road, Bur Dubai (Tel: 04-3523939). It’s quite likely that on Friday mornings you’ll bump into Bengalis who have come to do their fish-marketing. All varieties of Bengali Fish are available at the Bangladeshi markets in Backet in Sharjah. Rui Maach/Rohu fish is available at Lulu Supermarket in Al Barsha but the sizes of the fish being smaller than 1.5kgs results in a bit if disappointment in taste. And of course, the Backet in Rolla in Sharjah (you can read about my experience here). Substitutes that I’ve adapted over the years: Gondhoraj Lebu or the Bengali Lime has been the hardest to substitute so far. The closest I’ve come to the aroma of Gondhoraj Lebu is to drop in a few leaves of the Thai Kaffir Lime! Gobindobhog or the fragrant Rice that is traditionally used in making the Bengali Payeshis a special type of rice. Wikipedia defines it as ‘Gobindobhog is a rice referenced in ancient Indian literature. It was used as an offering to the gods because it was known to be, “The rice preferred by the gods”. It is a short grain, white, aromatic, sticky rice. It is grown traditionally in West Bengal, India. It has many traditional Bengali recipes intended for it specifically. It has a sweet buttery flavor and a potent aroma.’ There is a type of rice which comes from Bangladesh – the Chinigura Rice (similar to Basmati and Jasmine rice but with very tiny, short grains, resembling sushi rice). The latter, though less fragrant than Gobindobhog Rice is easily available in Bangladeshi shops in the Sharjah Backet. Notun Gur/Season fresh Jaggery can be perfectly substituted by using Date Syrup. One of my blogging friend Yummraj suggests that Maple Syrup works great as well. Aamshotto/Aam Papar/Dried Mango Bars if not available can be substituted by Dried Apricot Bars easily available in Carrefour and Lulu Hypermarket. Narkel Kurano/Freshly grated Coconut can be substituted almost perfectly by soaking dessicated coconut in canned Coconut Cream or in the worst case, fresh Milk! Dessicated coconut packets are available in frozen sections of most supermarkets. The different fish available in local supermarkets in Dubai that I often use to make traditional Bengali fish preparations… Lady fish fried in batter substitutes well as Topshe Maach Bhaja, Sultan Ibrahami cooked with Black Cumin Seeds substitutes well as Pabda Maacher Jhol, Cream Dori fillets wrapped in Banana Leaves substitutes well as Bhetki Maacher Paturi. Salmon steaks cooked in Mustard Paste and Mustard Oil substitutes, well sorry there can be no substitutes for this – the Hilsa! But it works quite well. Almost! Red Mullets can be cooked like Bhetki Maach and Needle fish can be fried crispy like Mourala Maach. As and when we started craving for Bengali food, we ended up learning from different cookbooks and the all-knowledgeable internet. Some of these Bengali bloggers have now become friends. However, more than the internet my go to guide to any type of cooking is a simple cookbook that has been my trusted guide for the last 20 years – N.I.A.W Cookbook. • Bong Mom’s CookBook by Sandeepa whose writing connects to everyone and is doing a brilliant job of ‘passing the legacy of Bengali food to my two little daughters and all the other little ones out there who growing up in a foreign land will find a way to connect to their Bangla roots through the smell and taste of Bangla cuisine’. • Finely Chopped by Kalyan whose Twitter introduction says it all…”They used to tell me stories to make me eat when I was a kid. Now I look for stories when I eat’. Food & travel blogger. Bengali based at Mumbai. Kalyan has recently come out with his book The Travelling Belly. I read a lot on Heritage Cooking and am specially intrigued by the recipes that were followed in the famous Thakur Bari (Rabindranath Tagore’s family) with the ladies of Thakur Bari churning up exotic dishes after having exposed to international cuisine during the times when most Bengali women hadn’t ventured out of their homes. My book shelves are stacked with some of the following cookbooks. These offer great insight into the art of cooking rather than mere recipes… Thakurbarir Ranna by Purnima Thakur, The Calcutta CookBook by Meenakshi Dasgupta, Amish O Niramish Ahaar by Pragyasundari Debi (PragyaSundari Devi, a scion of the Tagore family, used to write a column in a vernacular news paper on various recipes. That perhaps was the first column of its type in the end of 19th Century and the beginning of the 20th Century). Again, I couldn’t track this book to Amazon or online book store but you may read a bit on the first Bengali Kitchen Queens here. And a whole lot of books by Chitrita Bannerji, whose immaculate writing doesn’t only chalk out food guides but also the cultural history by weaving intricate relationship between food, rituals and art in Bengal. All pictures of Bengali food experiences here are from my very known kitchens – either mine or mum, mum-in-law or other close mums… and a few exceptional Dads’ as well! Sadly, not every dish or delicacy could be captured here – even in the pictures above which are examples of lunches at our homes during our visits to Kolkata (the first one at my mum-in-law’s place and the second one at my ma’s place). But I’m hoping that I have been able to tempt you to Bengali Cuisine and realise how difficult it is being a Bengali and not being a foodie! Dear Bengali readers, Shubho Mahalaya to you all! I would love to hear from you whether a tiny bit of justice has been done to Bengali Cooking. To the rest of my dear readers – Welcome to my world of Bengali Cooking! I haven’t even mentioned what we eat for Breakfast, or for snacks or on special occasions. Keep pouring in your comments and make my day delicious please! Disclaimer: This isn’t a sponsored post, nor are there any affiliated links. The subject, story, opinions and views stated here are my own and all my bills have been self paid. While you enjoy reading my posts with lot of visuals, please do not use any material from these posts. Do join me on my daily food and travel journey on Instagram, Facebook, Twitter and Pinterest. ← Featured in Foodie BlogRoll & Green Mango Chutney! Beautifully written about bengali cuisine and the culture, or should i say red and white culture to be specific. I have also written some blogs on bengali cuisine, please view and comment your thoughts. Your content is very informative and pictures taken are very beautiful and alluring at the same time. i have also done some research on bengali cuisine do check. Thank you so much for dropping inane for your very warm feedback – and welcome to my blog space! I did hop into your blog and the long list of all my favourite mishtis happen to allure me for more. And here’s more power to the love of food! Very humbled really. Thanks a ton for such a million dollar comment. On the hindsight, I should be vying for your attention – the contract could be mine! this is too good chhotai- u have to publish it somewhere! beyond everything that u have done- not to be unfair to the other ones. But really…. Hi Ria… well, I really waited till you could absolutely wipe out your drool! And your comment reminds me – yes – I’ve not had Dhokar Dalna for a long time – hence my picture gallery doesnt even have this. I must, must include this for sure… And yes, you are a black sheep in the Bengali community… veg? How can Fish not be your favourite? I hope I didn’t touch a sore point until and unless you find being the black sheep helps you steer ahead…. Fantastic thought but would that be giving too much of a ‘dhoka’? Haha. That was classic. Nope, dhoka just might like going non-vegetarian. I know my veg-to-nonveg convert friends did. OMG.. I loved loved ur post!!! Its like the Bengali food GUIDE!!! 🙂 I must say- Parwal brings back memories of my senior cooking for us at her home!! Thanks for this!!! Thanks Dina! Is Parwal not used in the South as a regular vegetable? There’s lot of similarity in Bengali Cuisine and Keralite Cuisine – the love for fish being one of them. What a bright, beautiful, not to mention, comprehensive post! Absolutely loved it – mouth watering fare accompanied by equally delicious photography…This post made me yearn for Kolkata and that’s a feat in itself 🙂 Great work Chotai! Wow! I do get some commissions from promoting Kolkata tourism! Well, jokes apart – thanks so much Keka – have to say the older I’m getting the more I’m craving for all these. Even have started loving Uche and Korolla… can you believe that? Great post. I can imagine the amount of work that has gone into it. Great collection of links too. This post has really put me into the festive mood. Dilipda’s Phuchka is a must. But all my friends insisted that I try another Phuchkawala who’s located just outside Dakhinapan – he serves jhaal-mishti phuchka! Do try a restaurant that has opened by Shiraz but having an ambiance where you can actually sit down and enjoy a bit of luxury unlike the earlier Shiraz. It’s called Dawat-e-Shiraz on the same spot where the old Shiraz was there. Well, what else… okay do try Bohemian – fusion Bong food on Old Ballygunge Lane beside the Repose Nursing Home on Ghughu Danga Bazaar… this is a must-try! Yes Maam – that sure does give me some time to think! Brought back such lovely memories. V sad to be missing Pujo in London this year in favour of a trip to Thailand! This is such a beautiful labor of work. I can imagine how much time and sincere efforts such detailed description would have taken. It’s an encyclopedia. Saving this post to share with my readers when I can. Thank you Dassana… and yes I can feel your empathy! Hopped onto your blog – a virtual treasure chest of veg recipes. I’ll surely be hopping in many times as my best friends are veg and they are always complaining that I cook the same veg food for them! How could I miss this one, I am amazed by the detailing and the effort you have put in this …hats off to you for sharing with us all so very beautifully Ishita about the culture, cuisine, cookbooks,blogs and everything about being a Bengali :)!!!!! Thank you Anamika… all’s well that ends well – you managed not to ‘miss’ this! Am floored with your lovely comment. Actually, I’m always coming across people who want to know more but I’ve never managed to compile everything together… hence! Wonderful, comprehensive post. I’m jealous as my parents are in Kolkata now during Durga Puja! Keep up the great work. In addition to the books you mentioned by Chitrita Banerji – I highly recommend her book “Festivals and Seasons” if you haven’t already. I love indian cuisine, always delicious…..
Sooooooooooooooooo Cute. This 10 am. I am at office. But watching that I need to go to my grand-mother house. Can u please suggest me some books on Bengali culture focusing on its culinary history? It would be of a great help to me in my research. Hope this helps. If I come across anymore, I’ll let you know. I have read these books, hence I mentioned. loved it..!!! mouthwatering…. living in dubai we truly miss these delicacies.. My husband is bong and i cannot cook even close to what u have posted… still learning.. lol … its pujo time and we both miss home.. but landing on ur blog truly made y day.. 🙂 if you read dis post do let me know where can we find some authentice bengali food.. we are very new here .. also where can we find pujo celebrations in dubai.. thanks a lot for a lovely blog… iam defi making the payesh for pujo..!! !happy pujo..! Dear Angelina! Welcome to Dubai:) Have I ever mentioned that I cooked well? I can write well about food. About Pujo in Dubai, there is a small Durga Pujo that takes place near the temple in Meena Bazar, in the Sindhi Hall… (http://ishitaunblogged.com/2012/10/24/rasgulla-macapuno-on-tv-shubho-bijoya-to-all/) It’s very very small. Abu Dhabi, there is another Pujo that takes place too but I don’t know much about it. Bengali fish available in Backet in Sharjah. If Sharjah seems too far, there is a Bangladeshi guy in Meena Bazar who also delivers home if you are staying in Bur Dubai. If interested, let me know – I’ll give you the telephone no. Closer to Dubai – there is another supermarket called Citi Mart in Rolla Road who sells Rohu, Pabda etc. Please call me Ishita. Thanks very much… I don’t know any Bengali cook now. However, there is a FB group… Bengalis in Dubai… why don’t you send request to join. It might be of much help. The Bangladeshi shop in Meena Bazar… number is 043550340. Shahil is the name of the guy… and every type of Bengali fish is available…. Bele Maach, Topshe, Rui etc Only thing is if you ask for Tyangra, don’t ask for very small fishes. I am a Bengali settled in Mumbai. However when I go to my native village in Poschim Medinipur I relish the original recipes in the natural surroundings and vegetables grown in the sticky grey soil. However, our cuisine is influenced by Odia cuisine to a large extent. Pithas chhena poda dalma etc. I want to know about authentic BangladeshI vegetarian recipes from Jessore region. Can you name a few? Well again, thank you so very much! I am truly humbled. May I share your last part of the comment on Facebook? A chance encounter with your blog, was looking for some good stuff on bengali cuisine. Must say it was the best read among all others I have gone through. Great. But what about some recipes of yester years which are now almost extinct? True. But in many other ways there are people like me who are doing so much of work just to dig out recipes from the past! Thanks very much Sucheta. Curious, where did you reblog this post? Google penalises websites for dual content. ja dekhlam khete khub ichha korche…. bangali rannar kache kono rannai patta khabe na…. Absolutely… where are you based? Do you not get to eat Bengali food? Great entry. I really enjoyed reading about Bengali food. So glad I stumbled across your blog. You are absolutely right… for some reason foods from the western and eastern parts of the country are not as well known. I absolutely LOVE Bengali sweets… sandesh was the first dessert I learnt to make! But haven’t been exposed to the other foods much. Recently a friend introduced us to the joys of fish preparations in kasundi… and I am absolutely obsessed with it now! Thank you very much! And you have won me over by saying that you love Bengali sweets. Fish in Mustard paste is a common preparation, but not in Kasundi – so am curious now! 🙂 Oh, are they not? She made me some awesome steamed fish with mustard kasundi… and I loved it so much that I am now the proud owner of my very own bottle of kasundi. That’s what I am curious about – not impossible and I am sure it’s going to taste phenomenal… but it’s not the regular mustard fish preparation. Would you be able to share the recipe? Great post.i like it. I really enjoyed reading about Bengali food. Wow you’ve got me salivating! Love, love Bengali food. By the way, where do you get pushto dana in Dubai? Thank you… do you mean *Posto*… officially its banned here, but unofficiially you will get it at many places… specially the Bangladeshi shops in Backet in Sharjah or even Deira Fish market. Khejur and Tomator chutney and cholar dal diye luchi makes me want to cry! I’m calling my mom tomorrow morning to get her recipe! Thank you… and you know what? If you still haven’t called up your mom, I could write down the long overdue post on Tomato Khejur Chutney which has been lying in my drafts folder. Yes please Ishita … Do post your recipe for this chutney! I was searching for the favourite sweet which was madeon GURUDEV’s birthday. This recipe also shown in the LOST RECIPES on EPIC channel. I am sorry Nivedita, am not aware of the recipe. Will let you know if I came across it. There’s a mistake. Bengal comprises the region that is modern-day west Bengal AND Bangladesh, not just West Bengal. You write about food, not just the Bengali kind, like no one else I know. The sheer essence of the home cooked or even restaurant food is brought to life in these virtual pages. The only comparison I can think of is the sheer anticipation of reading a much anticipated book by smelling its pages, is captured in the same way by looking at your visuals. I have been inspired to cook more Bengali food after I stumbled across your blog a year ago, and yes, blog more often as well. I am bookmarking this comment… I will look up when I feel down or don’t feel the strength to blog anymore. Touched beyond words… and I don’t feel so bad about not getting the posto… I know that someone thinks of me in London when making posto!!!! Hope you will always blog Ishita! You are my inspiration to cook more Bengali food and in a tiny way uphold our culture in a cold far away land. Do keep writing for ‘recipe-deprived’ lost souls like us! Touched, really touched. And humbled. I look forward to more blog posts from you! Foodstation.in(Ph: 9830217534 or mail at: kamalikamallick@gmail.com) is a one stop shop for every Bengali food lovers since it provides very useful and effective information about different types of Bengali recipes as well as restaurants in Kolkata. This portal enlists hundreds of healthy Bengali food recipes which are extremely delicious and which could be easily cooked at home. Very informative share. .it is nice to get all these things related Bengali food in one page,thanks for sharing. Takes me back to the culture!! Thank you so much Siddhartha! Very nicely threaded…can you upload anything on purano diner bhule jaowa bangla khabar.. Thank you Rupal for your warm feedback and welcome to my blog – a very special space in my life! Please give me an idea of what exactly do you mean by ‘purano diner bhule jaowa bangla khabar’… ekta duto udahoron dile khub bhalo hoy. Like nakshi bori, nana rokomer pithe… euirokom dhoroner ki? I am very keen to know, so please let me know.